This postcard of Chilcott Street in the twentieth century shows the cheap construction of the buildings. There was no incentive to build in lasting materials, when the Company would not sell the land. The closure of the mine in 1867-1868 not only affected the miners, but also everyone else in the community. The case of Benjamin Derrett illustrates the consequences of poor timing for one unfortunate storekeeper. Benjamin Derrett had arrived in the colony on the Telegraph on 15 October 1860, with his wife and family. Prior to this, a Joseph Derrett, of the colony, had paid part of the family’s passage money, sending it to John Budget of the Bristol Sugar Works in England. Derrett’s native place was listed as Wiltshire and his occupation as farm labourer on the shipping lists. His wife, Mary Ann, was a native of Hampshire. The family appears to have wandered before their emigration, with the children being born in Monmouthshire and Gloucestershire. Their religion was given as Baptist. Both Benjamin Derrett, father and son, signed the October 1863 Post Office petition from Cadia, though they did not appear to have signed the 1866 Common petition. Nevertheless, the family was centred on Cadia. Their daughter, Priscilla, married miner, Thomas Pearce, at Cadia on 22 March 1865 and had two children there in July 1867 and November 1870. 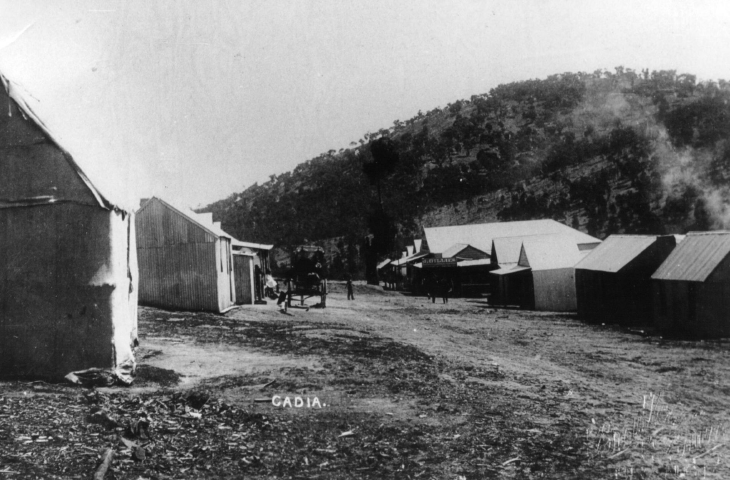 Benjamin Derrett, senior, began a store at Cadia in January 1867, operating from a shop, which he described “stands on ground I rent from the Company for £4 per year, as a yearly tenant. I paid Captain Holman £15 for the house when I took it”. Derrett invested £160 in stock for the shop, taking his son-in-law, Thomas Henry McIntyre, as partner, who only contributed £10 in stock. Within six months, they found that they had made a loss of £50. In addition, their families drew their supplies from the shop’s stock. McIntyre left the partnership in January 1868, taking out only the proportion he had put into the business. Loans and debts in a web of inter-relationships buoyed up Derrett at the same time as he buoyed up others. The bulk of his goods were supplied by Richard Sheridan and Allan Tipper of Orange, though Dalton Brothers also acted as suppliers. After McIntyre left the partnership, Derrett loaned him £30 on a promissory note. As well he endorsed a promissory note for McIntyre and others for £160. The closure of the mine in 1868 took away a large part of his clientele. Like many of the miners, he had been “waiting on the said mines with the expectation of seeing them opened, but have been disappointed”. When, William Mears, of Bathurst, the holder of the promissory note for his son-in-law, threatened to go to court for the balance of the note, £83, Derrett filed for bankruptcy on 10 March 1869. His schedule of debts revealed the desertion of the village by many of the miners, who had left Cadia after the closure of the mine. Some, such as butcher James Burfitt, miners Randle Crewe, Francis Jenkins, and John Aspinall were still at Cadia. Others, such as former storekeeper Francis Tate, labourer Amos Field, and miner John Jenkins, had gone to Icely. Others had gone to the mines at Burnt Yards to the south of Cadia, such as William Williams, possibly the smelter, and miner William Hussey. Derrett’s son-in-law, Thomas McIntyre, was at Cadia in March 1869, but by April, he had gone to Cargo. By July 1871, when Derrett was discharged from the bankruptcy he was a miner working at Lucknow. Over the next three decades, the surname Derrett was often seen at Lucknow. Derrett would probably have been happy to make “wages” as a storekeeper, but did not even succeed in that. His schedule of assets gives an insight into the goods stocked at Cadia in the 1860s. Amongst the goods were items that were associated with the conduct of the shop itself, such as scoops and possibly the gold scales and weights. The collection of Derrett’s debts in Cadia was handed over to John Trathen on the recommendation of the main creditors. Trathen was soon operating in the village as shopkeeper himself.